The small plane had made six attempts to land in heavy fog when it dropped out of the sky above Long Island. It had run out of fuel, and disaster loomed as it nosedived towards the quiet residential streets below. The rented Cessna, carrying a pilot and two passengers, grazed the roof of a church before hurtling towards a small bungalow. Then, moments before impact, it was stopped still in the air, its nose a few feet from the ground. It had been caught by a tangle of thick cables that run down the side of the street, held up by stout pylons, the nose just iches from the concrete pavement. When the police arrived the pilot, Dongil Kim, 27, was sitting on the kerb with his passengers, Hongjoo Na, 29, and Jumwoo Jung, 26. Their story started early on Sunday when their plane took off from the island’s Republic airport for a three-and-a-half-hour flight to Niagara Falls. The plane hit heavy fog on its return over New Jersey. Reaching Republic airport, Mr Kim made four attempts to land and then turned towards the larger apron of the nearby JFK international airport, where he made two attempts. 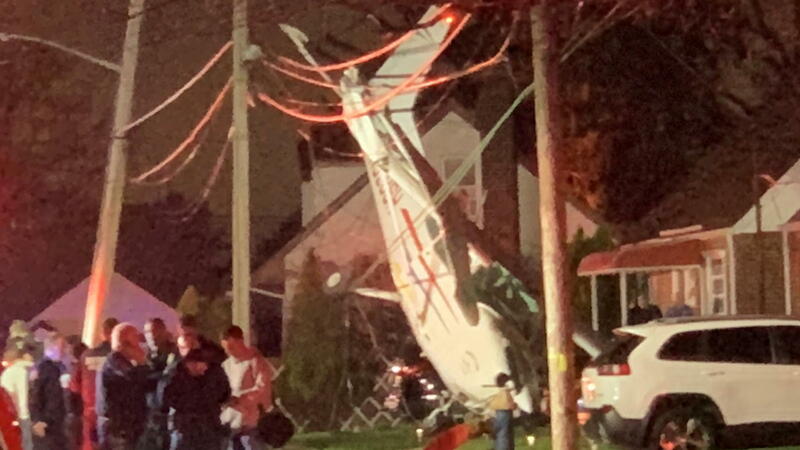 Just after 10pm, its fuel spent, the plane came down over the suburbs of Valley Stream. Mr Kim and his passengers managed to climb out of the cabin largely unharmed. Police said that only Mr Na had suffered an injury, a sprained finger that was treated at the scene.